Fixed a typo in 0.71 that caused a syntax error. Replaced the data file with a version by Gaeladria. 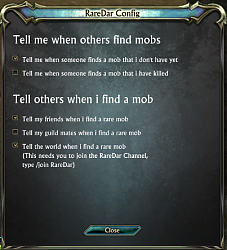 Added and corrected a few mob locations. Implemented informing other players when a mob is found. Updated LibVersionCheck to 0.02, added french names of Dendrome mobs and fixed dendrome mob/achievement map. Added locations in the Dendrome, assuming the PTS locations are the same as the real ones. French and Russian are still missing, expect them in a few days when there's a valid XML file on the trion FTP server. RareDar will detect if someone you're grouping with has a newer version than you, and inform you about that when you next log in. Fixed a lot of mob spawn positions in Brevane and Dusken, and added several locations in Iron Pine Peak. 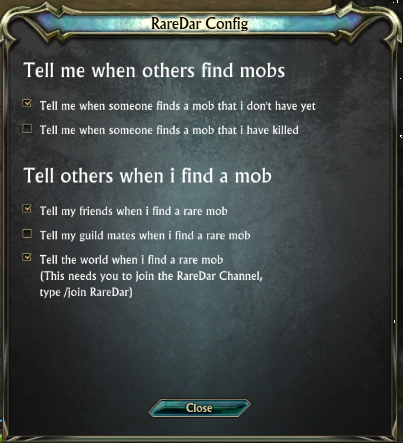 Mobs can have comments now, which are shown when you approach their location. For example, if you approach the vengeful spirit in silverwood, you'll get a message that you have to look for the hidden crypt and damage it to make the spirit spawn. All location and comment data is kept on the website http://riftrares.gbl-software.de, where you can download new data files faster than the addon itself updates. If you're knowledgeable about mobs, locations, and spawn events, you can help make raredar better by updating information there. Contact me at [email protected] if you want to help. Translators to french and russian are needed especially. RareDar has been dead for a while, as the original author and later maintainer quit the game, but i've taken over development recently. The current version works with Storm Legion, has several fixed mob locations, and a new/improved version of the database that allows for more than one location per mob. Improving mob locations will be the main development task in the next few weeks, so feel free to post any suggestions for improvement here. Can you please make it so we can make the menu go upwards, some of us put it on our lower parts of our screen. thank you for the added functionality with the chat channel messaging system. Can you give me the exact wording of the message so I can add the trigger to my act program? The part "Event.Unit.Available" is depricated and does not work anymore. If you change this part to "Event.Unit.Availability.Full" it should work again. (it gives no errors, but I haven't had the opportunity yet to test it with a rare). height:	The element height needed to display all lines of text. I'm gonna look into it later. A part of the code has been fixed though, as I got a notification when I found a rare. It seems like it can't initialize the window only. Last edited by lordhamani : 09-14-12 at 12:45 PM. Getting this error on login today after the 1.10 patch. Error: Event Event.Unit.Available is deprecated, the addon environment is not in compatibility mode, and RareDar has an active hook (named Display Notification). Is this still being updated? If so is there a possibility that the window could be hidden until it detects the mob? Thanks for adding the slash command! Maybe I'm overlooking something too simple, but how do I hide RareDar? The box is far from subtle and doesn't really flow with my clean UI I've spent hours tweaking. Yeah... I'm going to be reverting to an older version unless there's a way to hide it. Yeah, if you could have it force you to /tar the name of the mob so your little arrow shows you where, that would be nice. Because doing things manually is too hard!! and compare the targets name with a list of rare names? You would be surprised, that isn't possible the last time I checked. This addon is not actually very complex at all. Another example is not being able to play a sound. Practical? You bet. Possible? Nope. There is a disconnect in realizing this that is not only frustrating for me but also to the player who actually want very practical things. I think Rift made a huge mistake in not being developed with addons in mind and as part of release. Not to talk trash but the truth is they are trying to get their act together on the addon front. They are doing a hell of a good job but there is a lot of work to be done and addon authors are waiting. This overarching reason is why there are only a handful of Rift addons. If you want to help out the best thing you can do is either be patient or if you are more tech savy to make api requests in the addon forum to put more pressure on Trion. I havent run this addon yet so Im not sure exactly what it does or how it works. However, just by looking at the screenshot that when it finds a rare you are at least capturing the targets name. Create a button and setvisible to false. Once it finds a target, make the button visible and you can make the clickevent run the macro to target that variable. Easy to setup for that to happen. Whats the range on this addon? How close do you need to be before it can pick up a rare? The Shimmersand Air zone invasion event triggers "Swirling Tempest found". Last edited by stphung : 12-25-11 at 11:03 PM. It shows a new update I think? What changed? Russian/French included, fixed the set point bug, and added ember isle mobs.